What is ganache? That’s a great question! If you love chocolate, I am sure you will fall hard for ganache! Simply put, it’s real chocolate blended with cream. Really, that’s it. It is a simple concept with a slight learning curve. See, the chocolate will not willingly blend with the cream so it has to be coerced into accepting the cream and not seizing up or separating. It’s very much like a real-life relationship! Oh, chocolate ganache, how I love thee and want our relationship to remain strong. It can be used to make confections such as chocolate truffles or it can be used as a sauce, frosting, filling, or topping for a multitude of desserts. Ganache is very versatile, yet, the simplicity of ingredients makes this my favorite chocolate frosting or filling for cakes. It holds up very well for display and many decorating styles and makes an excellent support for fondant. It’s also magnificent as a pie filling. I probably could go on and on about it all day. Bubba Gump loved shrimp, I love ganache. 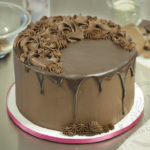 My claim is fame is my Chocolate Lover’s Chocolate Cake, pairing ganache with this chocolate cake from scratch recipe. See, not so hard. You will still hear people saying it all sorts of ways. I never correct a grown up, I know we are all just saying words the way we read them or heard them from somewhere else. That’s the easy part. It sounds easy anyway. The problem is that there are SO many different types of chocolate that the easy part becomes hard. In order for the ganache to set up properly, the ratios have to be right, more on that in a bit. The only ingredients are chocolate and cream and you need minimal equipment. One thing a lot of Americans don’t usually have is a kitchen scale. A kitchen scale is extremely useful when making a recipe like this. Success depends on precision and it’s very hard to measure precisely using volume. Here’s the one I own and love. I’ve had mine for 5 years now and I think I’ve only had to change the battery once! Zero problems. 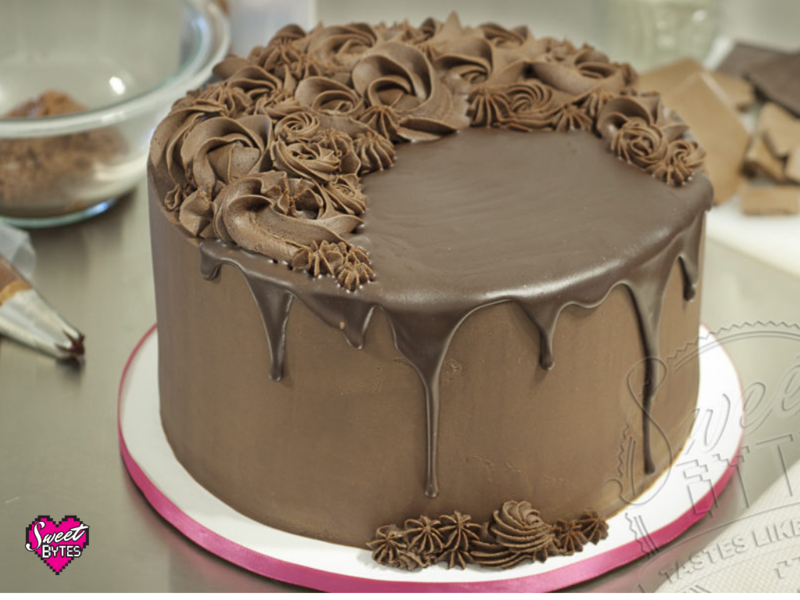 When you are making a cake using ganache as the filling or frosting, it can get really mind-boggling trying to calculate how much you will need. Since it takes hours for the ganache to set up, you really don’t want to run out when you are halfway through. The Ganacherator is an absolutely amazing FREE tool that will help you get your amounts and ratios right. I’ve found that it calculates for a very firm setting ganache that is perfect for use under fondant. When I want in less firm, I add 1 or 2 more ounces of cream to the calculation, depending on if I am making a little or a lot. I think it’s pretty amazing. Bookmark The Ganacherator and save yourself loads of trouble trying to figure out how much ganache to make. The following recipe will make enough for an 8″, 3 layer cake or a 9″ two layer cake, including some piped details. This ganache is perfect for truffles, frosting a cake, using under fondant, filling a dessert, or even a thick poured layer of chocolate. 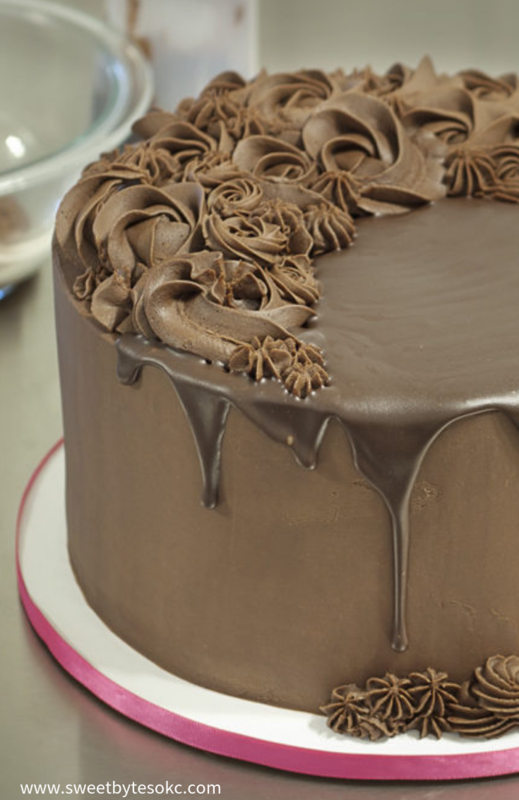 An easy to make, versatile chocolate ganache recipe for an 8 inch, 3 layer cake. Can be poured when warm, used at room temperature for a dense filling or frosting, or whipped for an airy texture. Chop chocolate and place in a large heatproof bowl. In small pan, heat heavy cream to near boiling. Careful not to allow full boil, it will overflow. Pour heated cream over chocolate and allow to sit for 5 minutes. Stir the chocolate mixture slowly, blending cream and chocolate until no chunks of chocolate remain. If you have trouble getting all bits of chocolate melted, you can microwave the whole mixture for 30 seconds at a time, stirring in between. Cover with plastic wrap laying directly on the surface of the chocolate to avoid condensation. Cool to desired consistency. Microwave for 2 minutes, let rest in microwave for 2 more minutes. Success comes from doing this slowly. Do not let the mixture get too hot too fast. Gently swirl cream back and forth in the bowl around the melting chocolate. The cream should start to look like chocolate milk. Return to microwave for 1 minute at a time, resting for 2 minutes, and gently stirring and scraping the bowl in between each time until all chocolate is melted and cream is blended into the chocolate. Ganache thickens as it cools. If it gets too cool, microwave for a few seconds to desired consistency. Store at room temperature for several days or in the refrigerator for a week. Pairs well with Chocolate Cake. Ganache Ratio sounds like something scary if you have a math aversion, but keep reading, we’ll break it down. The ganache ratio is the amount of chocolate to cream you have to use to have the ganache set up properly. If you have too much cream, the ganache stays liquified. Too much chocolate, the ganache will be too hard or even unable to blend properly. In order to get your ganache ratio right, you’ll have to experiment a little with the type of chocolate you are going to use. You DO NOT have to use extremely expensive chocolate, but a different quality of chocolate equals changing the amounts of cream. I will say that bars of chocolate are easier to melt in the cream than chips, which have additives to hold their chip shape. She even covers typical ganache problems and how to fix them! The principle is the same whenever you make ganache, for whatever use. The ratio of cream to chocolate has to be different. The recipe for a really good drizzle is equal parts cream and chocolate, in other words, 8 oz chocolate: 8 oz cream. This makes a thinner, more easily poured and drizzled ganache. Allow it to cool to 90°F if pouring on a well-chilled cake to avoid melting your frosting. You can make ganache shiny by adding a tablespoon or two of corn syrup or glucose at the same time as the cream. This won’t really work if you are whipping the ganache or making truffles. Flavors can be added to your ganache to create unique and amazing flavor combinations. Extracts and liqueurs can be added while stirring the chocolate and cream together. A small amount can make a big impact. Peanut butter or Nutella could be added to the chocolate before melting with the cream. Teas, herbs, and zests can be steeped in heated cream for up to an hour before reheating the cream pouring over the chocolate. Also, espresso powder makes a very nice addition. Almost any problems that you have with ganache can be fixed by returning to the melted phase. Grainy – heat over low heat while gently stirring, melting it all usually gets rid of any graininess. Too thick – add warm cream or milk, 1 teaspoon at a time and stir gently until blended. Split – this is when it looks curdled and separated – oily and gloppy- Slow down, try adding a teaspoon of warm milk to the warm split ganache and use an electric hand mixer to get to all to come together. If you have any questions, please, ask away! You can send me an email or leave a comment below.